In an aid to clearing out the freezer for christmas, yesterday I made a venison curry out of some venison we’d had in there for some months. 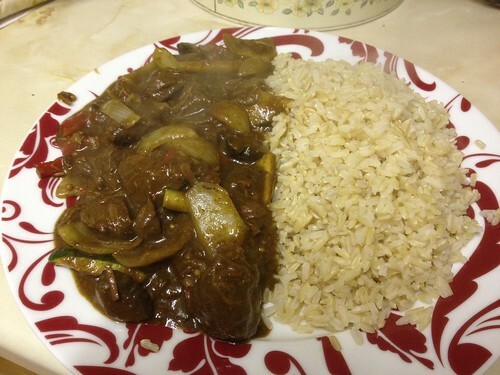 The curry I make is very versatile, you can make it with any red meat, it really doesn’t matter. It makes a very nice warming yet fresh tasting indian curry. Here’s the recipe. In a stock pot, brown the meat in some olive oil. Chop and add one of the onions and the mushrooms. Add the curry paste balls and stir until paste balls have broken down and have coated everything. Gradually add 2 pints of stock, stirring as you do it. Stir well and cover pot with a lid. Either turn down the heat on the hob or place in an oven at 160c. Cook for 2 hours, checking and stirring every half hour. After 1 hour 50 minutes of cooking, chop the remaining onion, red pepper, and cucumber into large pieces. Stir fry the vegetables in a pan using a little oil until cooked yet still have a bit of a crunch. Stir vegetables into the curry and serve with some rice or a baked potato.